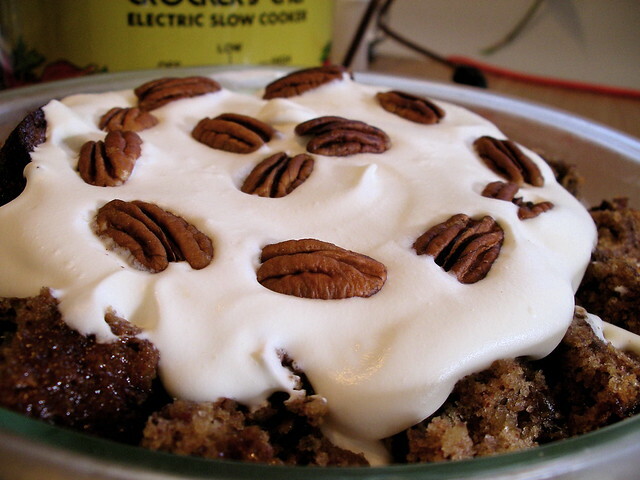 Grandma’s date pudding. Photo by jby. I could frankly do without a lot of holiday-time rituals, but I’m perfectly happy to have the excuse for baking. This year I made cranberry orange bread for the folks in my lab, following a great recipe in Mark Bittman’s magisterial How to Cook Everything. I’ve also taken a crack at Ma Savage’s Christmas Snowballs for one party, and for the departmental party, I dug up a family tradition: Grandma Bender’s date pudding. Preheat the oven to 350°F. Heat one cup of water to boiling, and soak one cup of chopped dried dates in the hot water for 20 minutes. Cream together one tablespoon of butter and one cup of sugar, and then blend in one egg, one cup of flour, one cup of chopped pecans (or other nuts), half a teaspoon of salt, one teaspoon of baking soda, and one teaspoon of vanilla extract. Finally, fold in the soaked dates and any liquid remaining with them; blend it all well. Spread this batter in a greased 9 inch by 13 inch cake pan and bake it for 25 minutes, or until a toothpick inserted in the middle of the cake comes out clean. 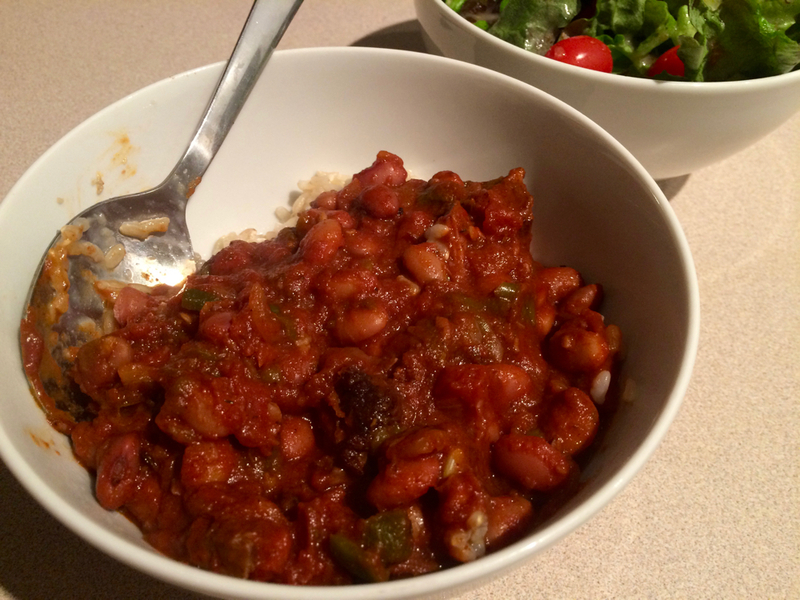 It’s been ages since I posted a recipe, but I’m still doing lots of cooking. 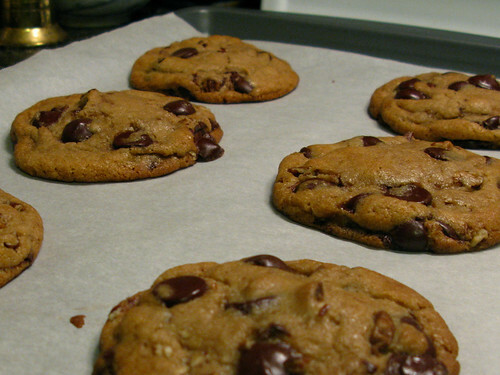 So, here’s another staple in my personal recipe book: chocolate chip cookies. I found the recipe on AllRecipes.com, but I’ve incorporated a couple of stylistic quirks from the New York Times food section. First, I refrigerate the dough at least overnight, or up to 48 hours, before baking. This lets the liquid (mainly eggs) integrate with the flour, for better texture. It also breaks up the work so it doesn’t take a whole afternoon at once. Second, I make them big. I form balls of dough a little less than the size of a golf ball, so the entire recipe makes exactly 24 cookies, at a rate of six to a cookie sheet-ful. Big cookies end up with a range of texture from a crisper edge to a chewy center, which you can’t get if you make them too small. And I can tell you from personal experience that big cookies make a serious impression when you bring them to a lab meeting, or (as I did with these) your dissertation defense. Blend together the shortening, butter, white and brown sugar, eggs, and vanilla. (Go ahead and soften up the butter and shortening in the microwave, if you’re blending by hand.) Sift together the flour, baking soda, and salt; mix this into the wet ingredients until they’re well blended. Finally, mix in the nuts and chocolate chips—I find this is most easily done by hand. Cover the dough and stick it in the refrigerator at least overnight, or up to 48 hours. When you’re ready to bake, preheat the oven to 375ºF. Pull the dough out of the refrigerator. Line a cookie sheet with baking parchment, which makes cookie removal and cleanup much easier. Form the dough into not-quite-golf-ball-sized spheroids, and place about six on a single cookie sheet. Bake for about 14 minutes, or until the very edges of the cookies turn brown and dry. I’ve come to feel strongly that you need nuts in your chocolate chip cookies, for crunchy contrast with the melted chocolate chips and chewy dough. Pecans are my preference, but go ahead and substitute walnuts if you must, or use no nuts at all. You Philistine. You could also make the recipe vegan, just by substituting more shortening (and a little water) for the butter, and using vegan chocolate chips—but I haven’t tried this, so I can’t vouch for it. I do know that spelt flour works perfectly well with the recipe, in case you want to reduce gluten.